Hello 2018. You came in downright cold today in most places here in the U.S. Friends have messaged me all day of -20 degree temperatures in the Midwest. I found it hard to leave yoga pants and my favorite sweatshirt and opted to stay cozy in said comfort wear all day and organize my office. (By the way, if you EVER see me attempt to purchase a journal or notebook of any kind in 2018 please STOP me…I counted 14 when I purged today. Yes, those are just the ones that are unused.) I’m pretty sure I purchase one every single time I see one I like. It’s a problem. We have kept the bottom cuttings from our Christmas tree for the past seven years. You know, the part you cut off so that water can seep up better through the trunk? Yeah, we keep them. 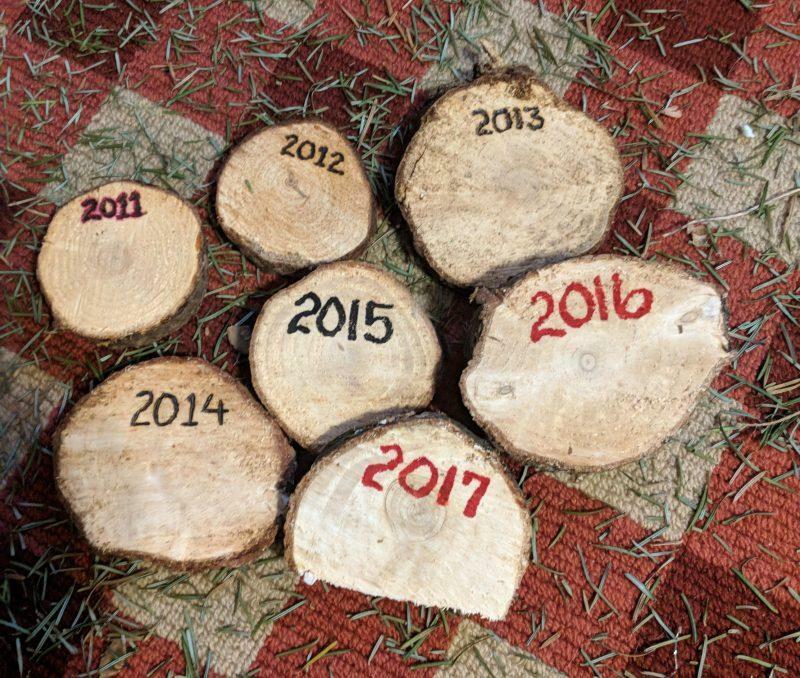 We take a sharpie and write the year right there. Then we line them up on our mantel as Christmas decorations, resting in the garland by the stockings. They are a reminder. We have to look back before we look forward. You can read most of the details HERE. 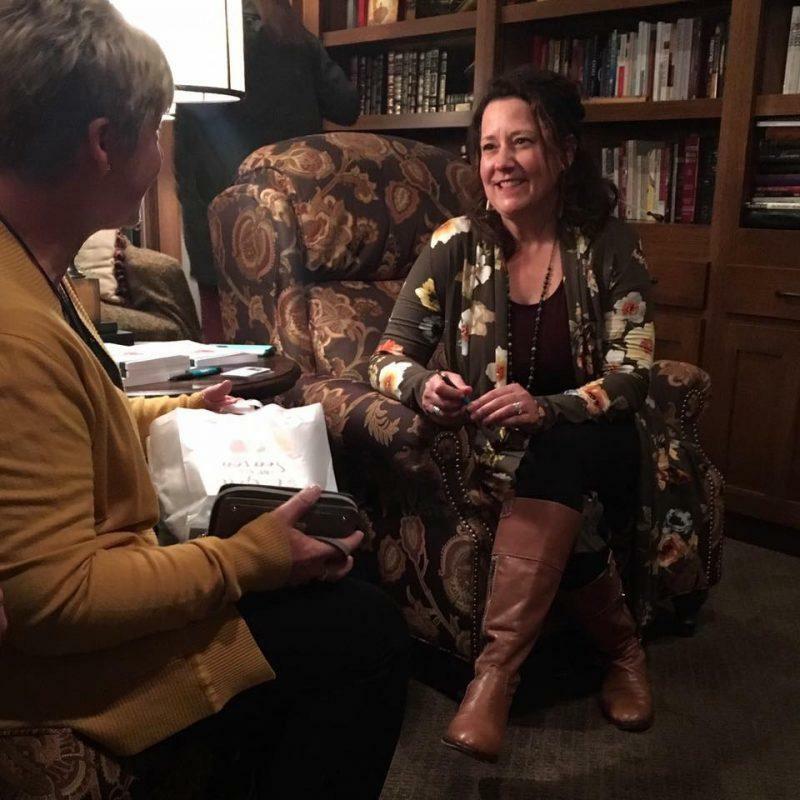 It was such joy to celebrate with Tammy at a few book signings and to talk 1:1 with others about the message of “A God Of All Seasons.” From copies being placed in a cancer center ministering to those undergoing chemo in Iowa to the woman who shared with me that she has used it as a daily devotional in the days after losing a loved one, God has moved powerfully. Sometimes I just had to get out of the way of who I thought the message might reach. 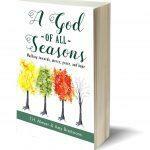 (Good news: The Kindle version of A God Of All Seasons is just $2.99 right now. Maybe a good way to start off your mornings this January? You can download it HERE. During the month of November Tammy and I did series of Facebook Live videos. (We went LIVE EVERY day, ya’ll!!) We intentionally took a few moments to notice the small, to realize where God was speaking in our season. It was a joy to connect with others in this way and really stretched us to open our bibles every single morning, to look for the God moments, even in the hard winters. If you missed these I have linked each live video below. Just click on the link that interests you or watch the whole series in January, a little bit at at time. The Story Inside You: What letter are YOU writing to the world? On vulnerability and coming out of hiding. On Obedience. When God says go, speak,share, act… do it! Words that heal. How can we give encouragement to someone else? Our Final Message and a Giveaway! This post really struck a chord. I penned it straight from my heart on December 10th and it clearly resonated. If you are living in “Hallway Moments” right now, this one’s for you. I see you. God sees you. You can interact with the original post HERE. Today is “D Day”: Diagnosis Day. Twenty years ago TODAY we heard the words “Malignant.” It was December 10, 1997. I had survived a four hour surgery. I was eight months pregnant and our daughter was still alive there inside me. The large tumor had been removed that was lodged right beside her. Twenty-nine staples lined my body which matched my age. At twenty nine I had ovarian cancer. I was still pregnant. A long road was ahead. I don’t remember much about that day. I do recall begging my mom from that bed in the ICU to tell me the truth about what they had found. I slipped in and out of consciousness, struggling with what I would later understand to be pulmonary edema, fighting contractions, and complications from the surgery from the many medications that were pumping through my body. My life and my daughter’s life were precarious. This man carried the weight of my cancer diagnosis and the worry. He spent much of his time in the hallway. My mom and his parents did too. We all walked hallways. The in-between places. He paced the hallways between the NICU and the cancer floor. He fought for me and for our family and he hasn’t stopped fighting. I survived ovarian cancer. Barely. Our daughter Shelby was born 15 days after cancer was removed from my body, at 6:14 Christmas morning. Don’t ask her if she dislikes having her birthday on Christmas. She’ll tell you she shares a birthday with Jesus. We all understand the miraculous nature of it all. Each year on D Day I have a range of emotions. I feel deeply blessed, incredibly awed that I even get another year on this planet, and I also relive the sadness, the despair, the “unfairness” of it all. This morning I looped my arm around my son in church, him standing much taller than me. I can hardly believe he was born 2 ½ years after my diagnosis. The biggest miracle of all. I nearly doubled over with gratitude. 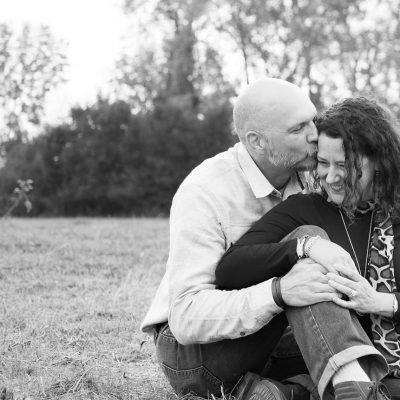 A year after my diagnosis, when my hair was just beginning to grow back and our daughter was learning to take her first wobbly steps I asked my husband a weighty question. I have never forgotten his response. We all know hallways, yes? The places between the now and and the not yet. The shuffling about in confusion. The questioning of everything, including God. I was in the room, battling in my own way but so many others were in the hallway. I almost didn’t post about my “D Day” today. I figured maybe it was time to just keep all my melancholy emotions to myself. But then I thought of you- ALL of you in hallways this holiday season. Those of you pacing, struggling, hurting, and questioning in hallways. Hospital hallways, yes, but also maybe just in caverns of pain and loss. Maybe with empty chairs around your table. If you are in a hallway this year I just want you to know that today, on my personal D Day, I see you. I don’t know what the thing is that brought you here. But I do know that God is tender enough to have come to this world in the most vulnerable of moments, in the most unexpected, broken, forgotten place that He could have showed up. He will show up in your hallway. I pick a “Word of the Year” and have for the past 5 years. This is simply a word to center around, to intentionally seek, study, and incorporate into my life. This year the word found ME. I’ve been asked to speak at a few places around the country in 2018. Something you may not know about me is that I was painfully shy as a child. Deeply introverted and a strong feeler, I was nearly mute during school days until the 2nd grade. Speaking was hard for me. It takes a certain kind of brave to speak. Writing has always been easier, safer. I have spoken a lot over the years on behalf of cancer patients, as a keynote many times, and I love speaking as a teacher in my roles as a professor over the years. I know HOW to speak, I just haven’t in awhile. But now I sense God widening my message and calling me to muster a braver voice. So my word for 2017 is SPEAK. To me this means speak love, speak truth, speak for justice. It is the opposite of being quiet and holding it in, which I am exponentially better at doing. I have another book in the works. It’s just an outline now with about enough content for six chapters, but it’s a message I feel very passionate about and a goal to publish it this summer. 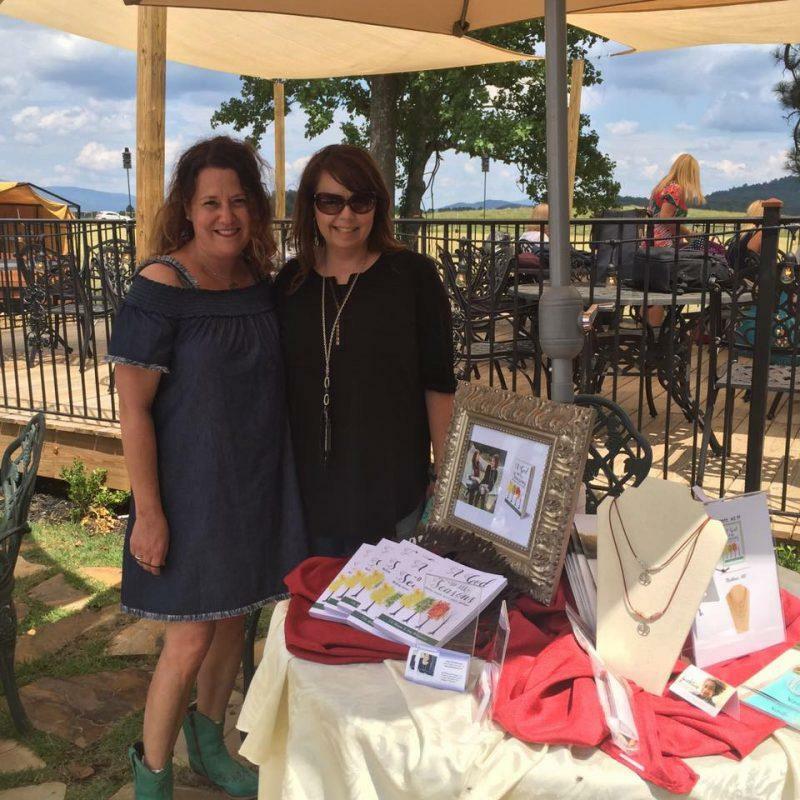 I also have a collaborative project I am re-visiting with my co author Tammy. This all makes me giddy. (After all, I am the girl who spent every day after school at the library…my library card was (and still is) my most prized possession. I’m a girl of words. And now my office is clean, so I’m off to a good start in meeting my word counts daily. Phew, thanks for staying to the end. This recap isn’t nearly comprehensive, but more of a wrap-up of my author/entrepenuer goals and memories. Later this week I’ll be sharing a post about my MUST-HAVES for 2018. You’ll want to make sure you are subscribed to my email list so you don’t miss that! Sign up HERE. I look forward to walking through 2018 with you. Because no matter what the calendar day, month, or year says, God IS a God of all seasons. And we are his beloveds.